French police received a tip-off about a planned attack in the days before the killing of a priest in Normandy, sources close to the investigation have said. The warning was about the second attacker in the murder, who has just been identified. "Following DNA tests, it emerged that the terrorist has been identified as Abdel Malik Nabil Petitjean," a source in the Paris prosecutor's office said, as quoted by AFP. Petitjean – who was shot dead by police outside the church following the attack – was 19 years old and was from eastern France. He had been on the security forces’ watch list – the co-called ‘Fiche S’, indicating he could present a risk – since June. 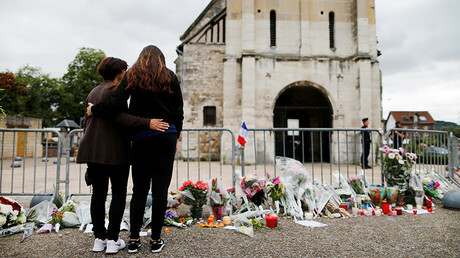 Before the attack, police had been searching for Petitjean for several days, and allegedly had information that he was preparing an attack, French media reported, citing sources close to the investigation. Petitjean’s photo was distributed to the police four days prior to Tuesday’s hostage-taking and killing, and the caption to the picture read that he "could be ready to participate in an attack on national territory." The other attacker was earlier named as 19-year-old Adel Kermiche, also a French citizen, from Saint-Etienne-du-Rouvray. Kermiche attempted to go to Syria back in 2015, but was deported from Turkey to France and put in prison, where he spent about a year. The authorities then released him on bail, although he was required to wear an electronic bracelet while awaiting trial for alleged membership of a terrorist organization. The two attackers were shot dead by police at the scene following the attack on Tuesday. Terrorist organization Islamic State (IS, formerly ISIS/ISIL) claimed responsibility for the killing, releasing a video on Wednesday in which the two young men are seen clasping hands and pledging allegiance to the group. In the footage, Kermiche identifies himself by the nom de guerre Abu Jaleel al-Hanafi, and says Petitjean is called Ibn Omar. Currently, there are about 10,500 people on the ‘Fiche S’ suspected of links with potential jihadist activity in France, according to data provided by Reuters.